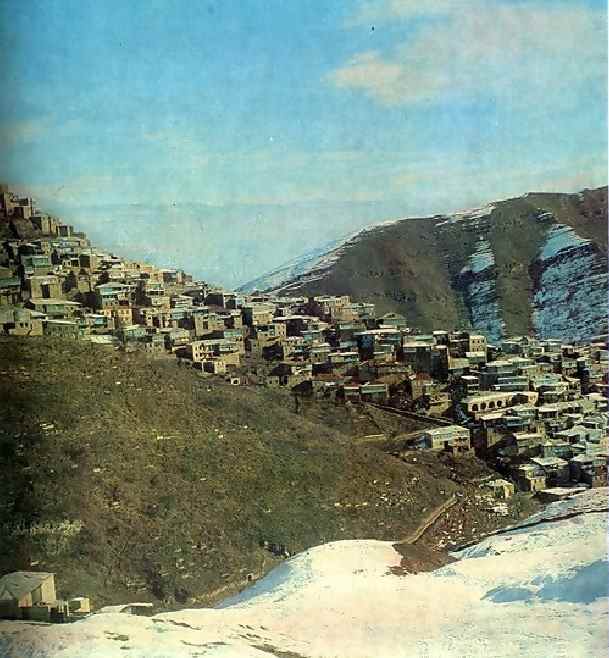 Kubachi is the village whose name is known far beyond the borders of Dagestan (Russia). It is located high in the mountains. 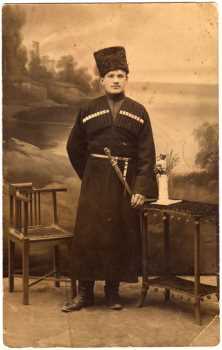 The Darghins live there, representatives of one of indigenous nationalities of Dagestan. During the middle ages the village was widely known in Dagestan and abroad as an important metalworking centre, where coats-of-mail, swords, daggers and the like were produced. This village is located very close to the Dagestan's capital Makhachkala. But it's more than 40 hours by train from the Russian capital Moscow. Dagestan is a small part of federal Russia. The name of the village - Kubachi - represents the Turkic from the Persian word "Zirihgheran", which means "makers of weapons". This land was mentioned by some Arab and Iranian historians and travelers as early as the 9th and 10th centuries. Silversmiths manufactured many different elements of arms and the costumes for warriors such swords, daggers, guns and cartridge belts, or belts. The pictures show similar products as part of the suit at the Caucasus. The fame of Kubachi has been created by the skilful hands of its residents, who are masters of the amazing secrets of metal chasing. The craftsmanship of the local goldsmiths has been passed from one generation to another. And that's why any boy or girl, who hasn't yet learned to read or write, can handle the chisel and work elementary designs on a copper or brass plate. Kubachi - is an example of local craftsmanship silver production. It is very characteristic of Russia (old and new). The wood products from Khokhloma and other villages under Nizhniy Novgorod, trays from Zhostovo, lacquer miniatures from Mstera and Palekh, multicolor enamel silver items from the Velikiy Ustug are known around the world. Every house in Kubachi had the handicraft workshop in old times. Their homes are like miniature museums. In Soviet times, these artists have joined as crew -manufacture. This has led to a significant increase in the number of products, but is unlikely to add a little bit of quality. The traditional nielloed silver object done by Kubachi jewelers won high acclaim at the 1937 Word Exhibition in Paris. Surprising distinctive feature of Kubachi products is no items with identical picture among them. The form of products changes a little by centuries. But view - the face of a product - is always different. The list of products of Kubachi masters is great. 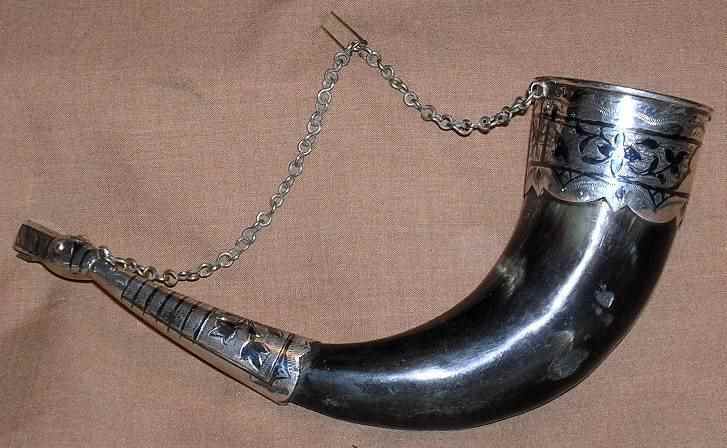 But in the given essay we will only look at some drinking horns. This is one of typical of Kubachi products. In local museums there are the samples made in the beginning of 19th century. 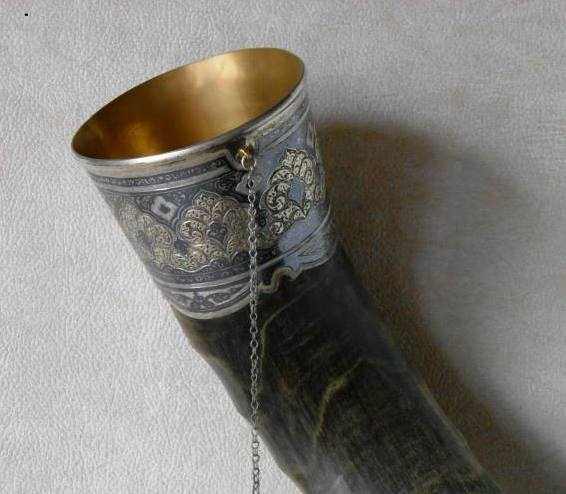 Ritual horns from the precious metals, intended for leaders of ancient tribes, today have lost the former direct destination, but still keep the importance and beauty. The refined work of masters gives the delightful refinement to it. 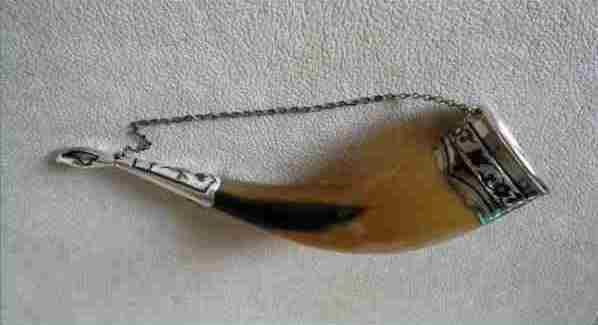 Silversmiths are used for manufacturing the natural material - sterling and a horn of the bull or ox. 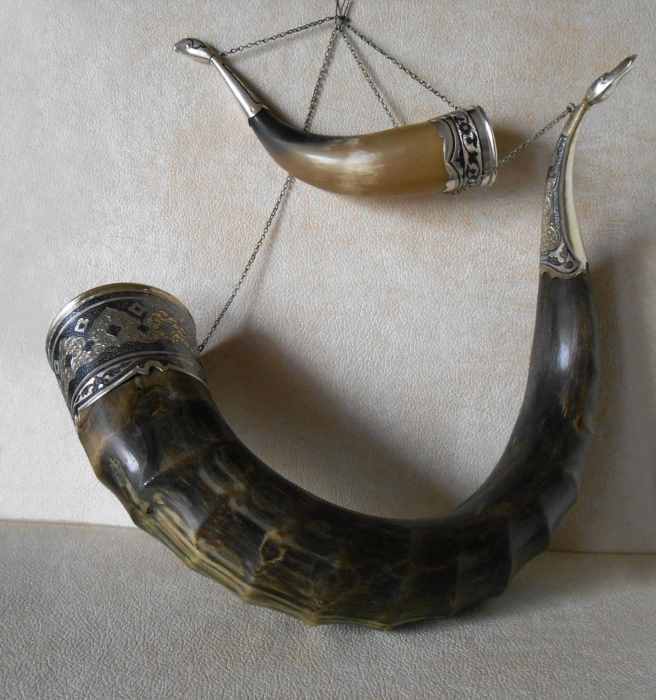 Magnificent silver horn is unusual capacity for wine. Still our distant ancestors have opened, that any liquid, adjoining to silver, gets an amazing taste. Especially if it refers to wines. For this reason princeses preferred to taste wine from silver cups. With such drinking horn filled with wine it would be desirable to wish to dear friends of east longevity and wisdom with all my heart. Wine drinking horn bears the silver hallmark of a worker's head and standard 875. The district mark is "O". This combination was used between 1954 and 1958. Tbilisi assay inspection. The gore point features a niello figural bird's head, which is also hallmarked. It is about 7 1/2" long tip to tip and about 2" in diameter at the widest part of the lip. 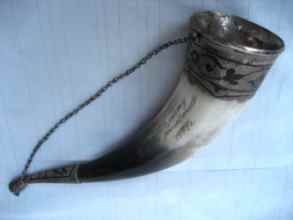 Other real horn and niello sterling silver. IKXK -Kubachi artistic combine, hallmarks includes the sickle and hammer inside of a five-pointed star - USSR, 1971, "875" standard. Letter M - Moscow assay inspection. Some more horns... Glamorous, elegant, classy, sophisticated, originally designed and charming. Always in perfect taste. Each item has different ornament. The next horn is very unusual. It is nice antique original traditional Kubachi/Georgian silver drinking horn. The item was made late 19th century. 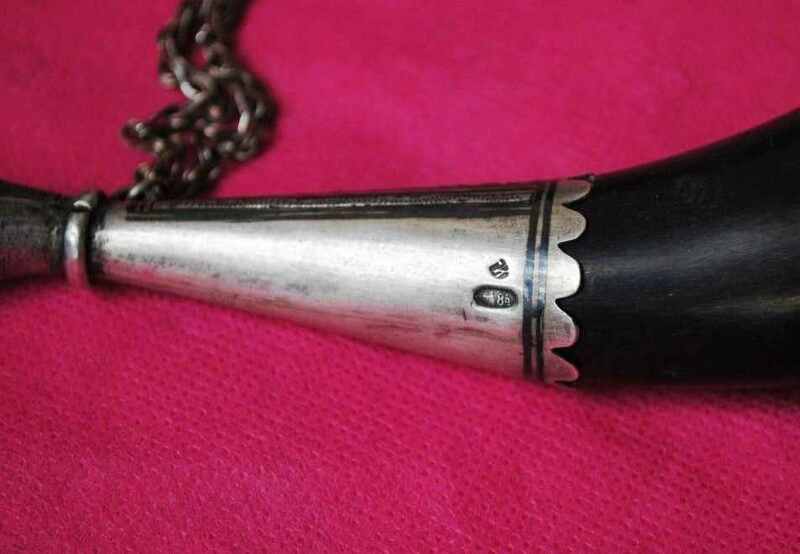 This horn has an imperial Russian silver marks "84". 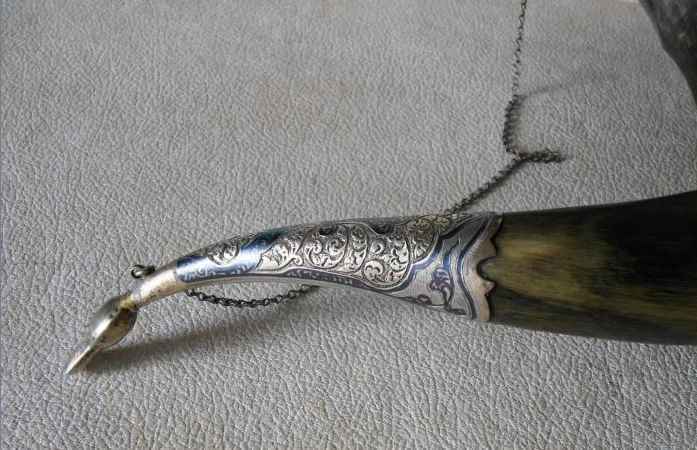 A pair of late 19th century Russian horns with silver niello mounts. I was only able to find the marks seen in the close up. Hard to photograph and see but the "84" mark is there and then other marks of the spacer ring. Each horn is approximately 11" long. 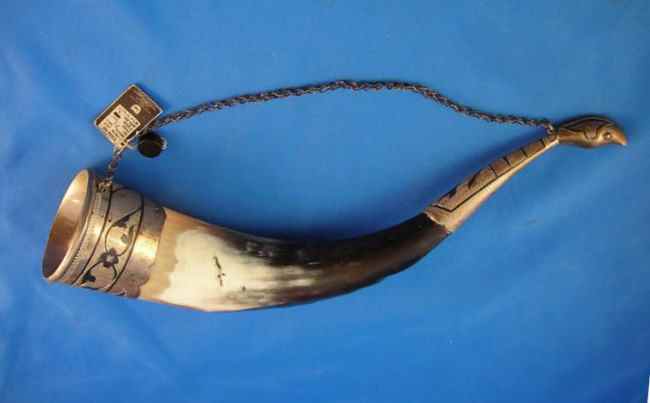 The special beauty distinguishes greater drinking horns. 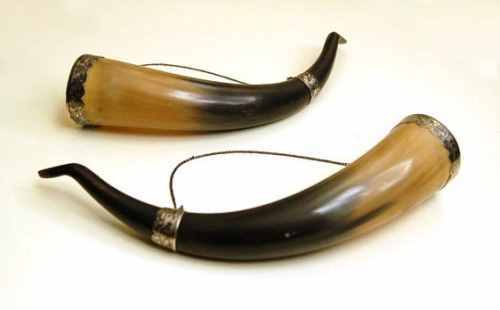 The powerful crooked ox's horns serve as basis for them. 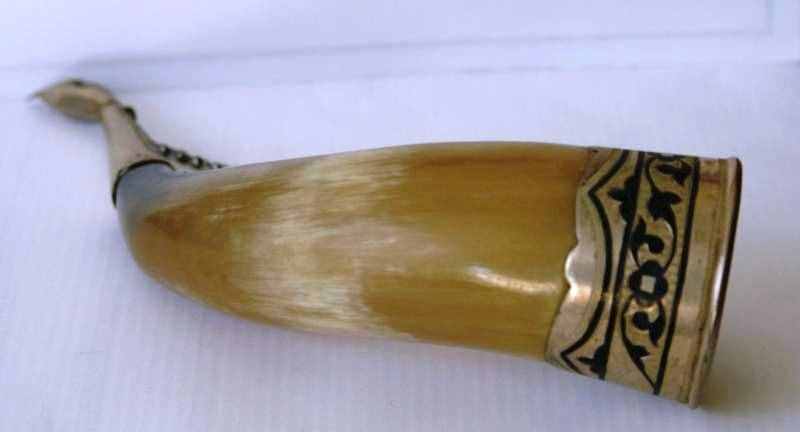 When I am holding a large horn in hands, I see the usual drinking horns, described by us earlier, like gold of the Mexican shop in comparison with royal ornaments. 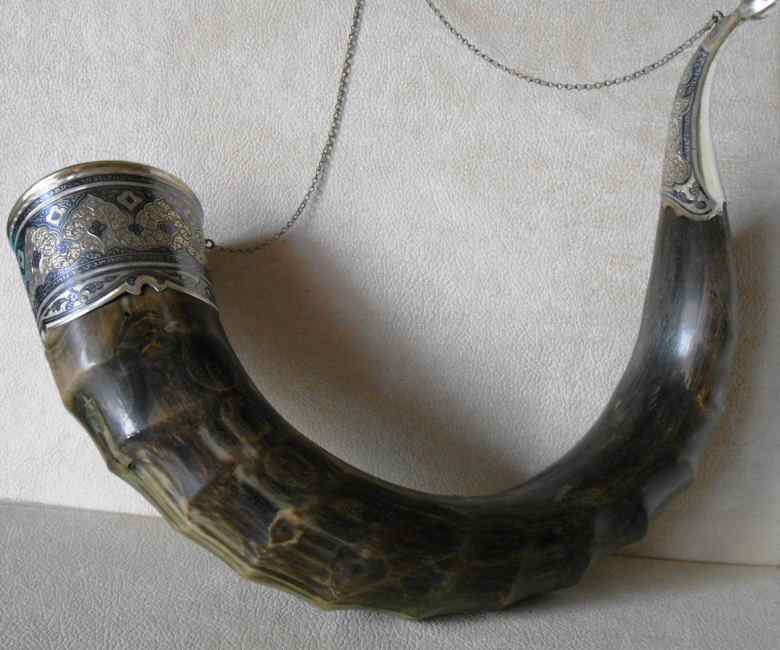 The length of this horn exceeds 20". The volume of the horn is near to 1/2 gallon. 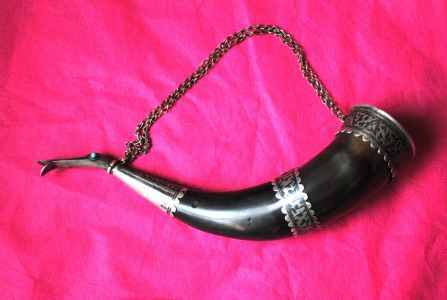 A usual horn contains about 1-2 glasses of wine. It's like a "bratina" as they spoke in the old days -a vessel for the incorporated friendly company. A vessel, which passes from hand to hand. Certainly, it's not a vessel for wine any more, it's an ornament. The ox horn is inlaid Kubachi jewelers of silver of 875 tests. Next pictures show the parts of big crooked ox's horn. 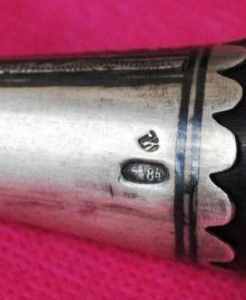 Many of Kubachi products don't have any hallmarks. This is because the masters make their products at home as gifts or to make some additional income. Often, these products are not inferior items with hallmarks and sometimes even surpass them in quality work. 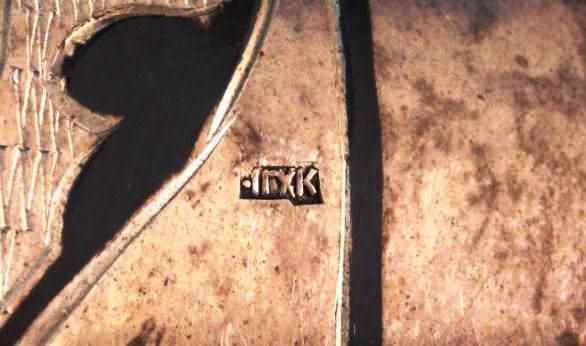 Since 1908, new hallmarks with the image of a female head in a kokoshnik are entered on all assay districts, the head facing right, accompanied letter of the Greek alphabet -various for every assay districts. Zolotnik marks- no changes. 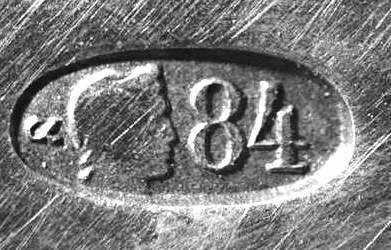 The hallmark as a head of the worker with a hammer with code of assay inspections as the Greek letter or a version of dots and hyphens was used after 1927. Test is designated by number of thousand fractions of silver in an alloy. Moscow - Delta or one dot under a hammer. Tbilisi -Omicron (O) (or dots in front and behind a head). Baku -Zeta (Z) or two hyphen in front and below. These kinds of marks were applied in 1958 with a few changes. Since May, 7th 1958 hallmarks included the sickle and hammer inside of a five-pointed star with code of assay district in the form of the Russian letter or dot and/or hyphens. The mark also included the purity test (875 meaning 875/1000). On the products of Kubachi artistic combine (KXK) there can be codes of Moscow (M), or Baku , or Tbilisi (T) assay districts. 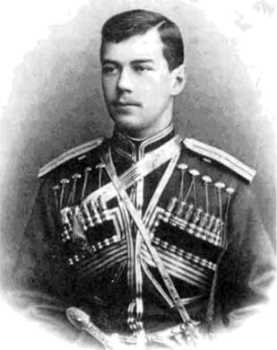 In different years there were also codes of Kostroma (K) or Kharkov (X) assay inspections. Moscow - the letter M or one dot on top left to angle of a star. Tbilisi - the letter T or a dot and a hyphen on bottom to angle of a star. Baku - the letter or one dot on top right to angle of a star. Kostroma - the letter K or one dot on bottom left to angle of a star. Kharkov - the letter X or a dot and a hyphen on bottom left to angle of a star. Since 1953 they began to add a code of the manufacturer as a last digit of the year. For example: KXK5 confirms that the product was made in 1965. The table shows data for products Kubachi artistic combine (KXK). Thus there can be the codes of Moscow (M), or Baku , or Tbilisi (T) Assay districts. In some years there were also hallmarks codes of Kostroma (K) or Kharkov (X) Assay districts. Since 1994 assay hallmarks operating were applied and are still the same today. It is the image of a female head in a kokoshnik, directed to the right. Codes of assay districts have remained without changes. 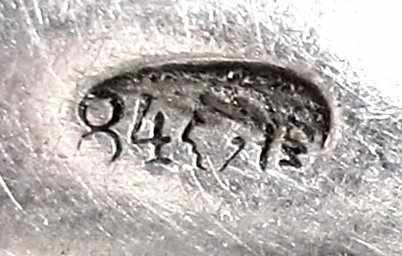 Hallmarks with a star were used partially until 2002. Kubachi products are constantly present in the jeweler market of many countries. These products are beautiful and others are not similar of Kubachi object. It is this creative approach to old Kubachi art that distinguishes the best works of the leading craftsmen of our time. Do not look for in a thread of silver. In the heart of Kubachins master. 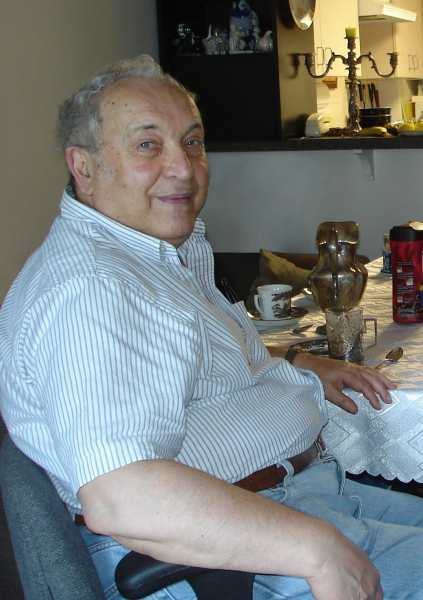 Lazar Freidgeim, engineer, research fellow. He was born in Moscow, the capital of Russia, and has lived there most of his life. Since 1991 he lives in California (USA). In 2003 - retired - he began to publish his articles and essays in magazines, newspapers and online. His hobby is collecting old Sterling silver, mainly from Russia. His main interest is silver with images of architectural monuments of Moscow.